An anhydride is a water reactive compound that gives an acid or a base when combined with water. 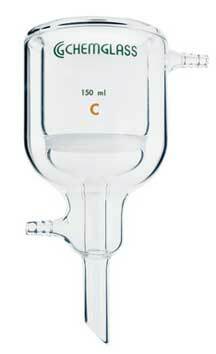 Many substances are not themselves acids or bases, but will become such when exposed to water. This does not necessarily require the addition of water (such as from a fire hose). Many anhydrides will react readily with ambient humidity and even the water present in your skin or lungs! See the links under Further Reading below for the preparation and reactivity of other anyhydrides. 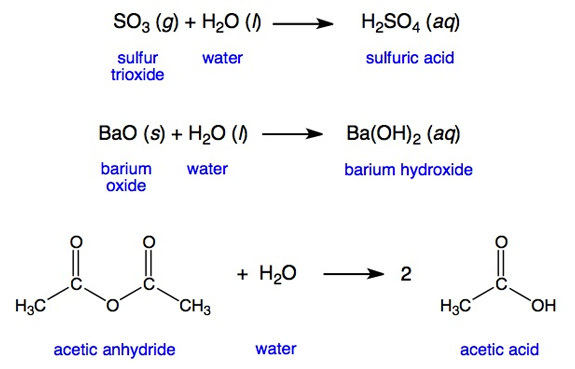 The reaction shown in the first equation which forms sulfuric acid is one step in the reaction of sulfur oxide emissions to form "acid rain". The reaction to form acetic acid is used in certain silicone caulks, leading to the familiar smell of vinegar (vinegar is a 5% solution of acetic acid in water) while the caulk cures. 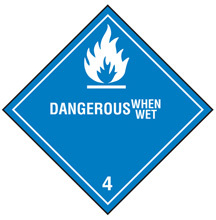 Treat anhydrides with great respect, keeping them away from water and recognizing that they can be as dangerous or corrosive as their corresponding acid or base. Always wear proper personal protective equipment, including chemical splash goggles and gloves when handling anhydrides. As noted above, reactions of anhydrides can often be violent and exothermic. Plan experiments and emergency procedures to deal with such situations before beginning your work. Derivatives of Carboxylic Acids, from Michigan State University, which includes discussion of anhydrides. Reactions of Acid Anhyrides With Water, Alcohols, and Phenol for you organic chemists out there. Nomenclature (naming) of Acid Anhydrides at the University of Calgary as well as LibreTexts.org. See also: acid, base, hygroscopic, IUPAC, pH, water reactive.